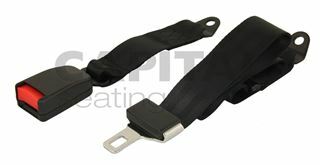 A durable 2-point static lap belt with webbed buckle. Suitable for a range of applications including cars, vans, forklifts, tractors, construction machinery and more. The belt is approved to European standards and meets ISO6683. The belt kit includes the industry standard 7/16 UNF bolts for mounting. We offer a wide variety of different types of seat belts and harnesses, suitable for all vehicle applications. If you require a certain specification, looking for bulk purchasing for trade supply or a vehicle project, or simply require additional technical information, please contact us and we will be happy to assist.